Note: You can enter this giveaway three (3) times per e-mail address per day. Deadline is 11:59PM ET 10.11.18. Muffins and cookies and cakes, oh my! 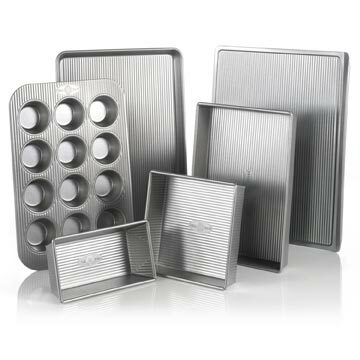 All of your baking needs are covered with this 6-piece set of nonstick bakeware that includes a large cookie sheet, a half sheet jelly roll pan, a 12-cup muffin pan, an 8-inch square cake pan, and a 9-inch by 13-inch rectangular cake pan. Imagine your kitchen counters spilling over with Croque Madame Muffins, Thousand-Layer Chocolate Chip Cookies, and Pound of Chocolate Cake. You’ll only be limited by your imagination and perhaps the size of your oven. To make sure you’re kept abreast of our giveaways, subscribe to our new giveaway-only feed. If you want to stay on top of our recipes and writings, subscribe to our general feeds, e-mails, or digest in the column to the right. Visit our FAQs page, if you have questions. NO PURCHASE NECESSARY TO ENTER OR WIN. Void where prohibited by law. Open to legal residents of the 50 U.S., D.C. and Canada (excluding Quebec) who are at least eighteen years old at the time of entry and have internet access. Begins on 8.15.18 at 12:00 a.m. ET and ends on 10.11.18 at 11:59 p.m. ET. To enter this giveaway, submit your full name and email address on this form. Odds of winning this giveaway depend on the total number of eligible entries received. Only three (3) entries per email address per day. Sponsored by Leite’s Culinaria, Inc. For more information, visit our Official Rules. For a list of winners, check out our Very Happy Winners page. Be sure to add giveaways@leitesculinaria.com to ensure notification if you are the winner.